Yesterday, Samsung’s next big thing finally hit stores. The Galaxy S5 is now out and available for purchase. Now this also means we’re going to see a ton of ads and such for the Galaxy S5 now. As the marketing blitz has begun. During Samsung’s Unpacked event in Barcelona back in February, they touted some of the battery saving features on the Galaxy S5 – which HTC also announced in the HTC One M8 about a month later. One of them being the ability to get around 30 hours of battery life at 10%. That is just insane. It’s due to the standby, and the ability to turn your phone’s screen into a grayscale theme. So that instead of colors, you just get black and white – kinda like the Pebble. 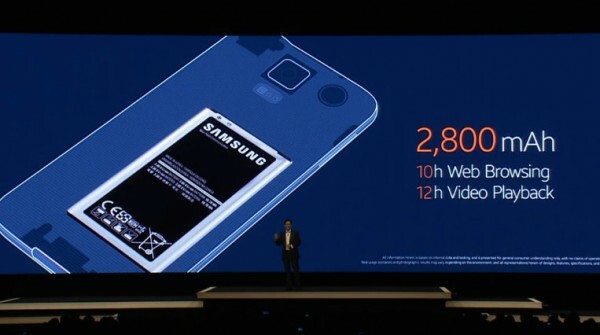 The Samsung Galaxy S5 features a 2800mAh battery, which is a slight bump over the Galaxy S4′s battery last year. The screen was also bumped up a tiny bit, to a 5.1-inch display but still a 1080p display. It’s also featuring the Snapdragon 801 processor which should allow for some pretty good battery life. It’s hard not to compare this to the LG G2 for a couple of reasons. One because that’s my daily driver and two because the G2 has amazing battery life. Now the Galaxy S5 does have a slightly smaller battery, but also a slightly smaller display. There’s also not a whole lot of differences between the Snapdragon 800 and 801. So in theory, battery life should be pretty similar between the two. Of course, we’ll have to wait til we get a review unit to really put it through it’s paces. From what I’ve heard about the Galaxy S5′s battery and how it performs, I’m pretty impressed. And as someone who is always wanting a bigger and better battery, I’m definitely going to be checking out the battery life and putting it through it’s paces once Samsung sends me a review unit. For those of you that already have the Galaxy S5, how is the battery life treating you? Better than the Galaxy S4 – I sure hope it does? Let us know in the comments below. The post Android Headliner: Samsung’s Battery Saving Features Are Awesome in the Galaxy S5 appeared first on AndroidHeadlines.com |.